It is 3:40 in the afternoon on Aug. 28, 1988. Ten brightly-painted jets swoop in a neat v-formation over Ramstein air base, a major U.S. military installation in West Germany. Below, 350,000 spectators cheer at the final act of the Flugtag ’88 air show as they scoop up ice cream and devour hamburgers from dozens of food trucks and outdoor grills. The crowd is a mix of West German civilians and personnel and their family members from the military base. The fliers belong to the Frecce Tricolori — “Tricolor Arrows” — the elite aerobatics team of the Italian air force that formed back in 1960. They are flying Machhi MB-339As — small, single-engine jet trainers painted with green, white and red stripes over a dark blue background. The Frecce had taken off four minutes earlier with a full load of fuel. They’re about to attempt their first maneuver of the day. Dozens of onlookers on the ground are already recording them with handheld video cameras anticipation of what will follow. The “pierced heart” is a favorite at air shows. Swooping upward, the 10 Tricolori jets abruptly split apart. Five MB.339s peel off to the left and four roll over to the right. Each v-formation sketches a neat line with trailing smoke that will form a heart when the two groups pass by each other just a hundred feet above the ground, parallel to the airstrip and the crowd of onlookers. The last MB. 339, designated Pony 10, is piloted by Lt. Col. Ivo Nutarelli, the group’s soloist. He begins a straight roll oriented towards the crowd. His job, the trickiest in this maneuver, is to “pierce” the heart by soaring through the two intersecting groups at a perpendicular angle and overfly the jubilant spectators. At 38 years old, Nutarelli is the oldest on the team and has 4,100 hours of flight experience. You don’t get to be a soloist without an excellent record. He has already performed the Pierced Heart seventy times in his career. His last attempt was only yesterday, though he completed the maneuver a few seconds late. Today, his timing is slightly off again. His plane flies up higher than expected, then dives down too fast. Nutarelli hastily pulls up the belly-mounted airbrake to slow his descent. Below him, the five MB.339s on one side of the “heart” are on a collision course with four jets on the other as they hurtle towards each other at 350 miles per hour. But, as rehearsed, the two formations thread through each other just 130 feet above the ground, completing the heart figure as the crowd roars. Plunging towards them, Nutarelli does everything he can to slow down his diving plane. His MB.339, designed to withstand a maximum of seven times the normal pressure of gravity, pulls ten Gs as he yanks up on the control stick. But now he is flying too fast, too low, and fatally intersects too soon. Nutarelli’s plane soars to soon across the Left formation with Pony 1 in the lead. Nutarelli’s left elevator clips Pony 2, piloted by Capt. Giorgio Alessio, smashing the cockpit and killing him. Alessio’s plane disintegrates in midair, spraying burning metal parts across the airstrip below. Pony 3 and Pony 5 flying next to him are riddled with fragments of debris, but their pilots manage to keep their machines aloft. The impact causes the fuselage of Nutarelli’s jet to careen into Pony 1, flown by Lt. Col. Mario Naldini at the head of the left group, shattering its tail section. The impact smashes the front of Nutarelli’s plane, killing him, and sending his plane cartwheeling in flames across the sky. The fuselage of Pony 10 smashes into Pony 1 in the lead. A cloud of debris can also be seen blossoming around Pony 2. The lead aircraft is also sent into a uncontrollable spin, this one parallel to the airstrip below. Naldini manages to eject, but he is too close to the ground for his parachute to open and is killed when his body strikes the runway. Pony 1 slams into the runway, with Pony 2 not far behind. The three surviving aircraft of the element pull away above. There is a UH-1 medical evacuation helicopter parked on the strip with a crew of seven standing on alert in case anything goes wrong. But they will not be coming to the rescue today. Pilotless, Pony 1 slams into the ground while traveling hundreds of miles per hour, its momentum carrying it hundreds of meter trailing a massive ball of fire into the parked helicopter. The entire medevac crew, and especially its pilot Lt. Kim Strader, are severely burned before they can be pulled from the wreckage. Meanwhile, onlookers are too stunned to react as Nutarelli’s flaming aircraft hurtles toward them carried by its momentum, spinning and cartwheeling in the air like a bird with a broken wing. The jet is nearly belly up when its left wingtip slams into a grassy field just 50 meters short of the front row of spectators. The nearly 300 gallons of jet fuel in its tank ignite, releasing a tsunami wave of fire. The blazing wreck plows onward, demolishing a police car and smashing through a barbed wire fence into the crowd. It finely skids to a halt as its upends an ice-cream truck, triggering its ejection seat, which launches the pilot’s body into the vehicle. Seven seconds have elapsed since the collision. Shrapnel and debris have killed around 31 onlookers on the spot and injured around one thousand. Hundreds of spectators are badly burned, their clothes seared off and skin scorched and melted. Only the presence of numerous parked cars and trucks has helped absorb some of the blast. Overhead, the seven surviving Frecce jets, some of them badly damaged, assume a missing man formation and head for a satellite airstrip. Panic and chaos abound on the ground. Survivors stampeded away from the expanding cloud of fire and smoke. Then, many turn around and run back into the flames to search for loved ones, including numerous children. Firefighters are on the scene within two minutes. Within seven, the first of nearly a dozen American and German rescue helicopters land and begin picking up the hundreds of men injured. But the air base is not prepared for a mass casualty event. There are failures in coordination and communication across the board. The U.S. military transports injured victims without providing first aid on site. Many injured are carried away on civilian motor vehicles, wandering randomly into nearby regional hospitals. German ambulances eventually arrive to respond to the disaster, but base security initially refuses to let them inside. The telephone network is flooded with emergency calls until it collapses. Amateur radio operators attending the show are used instead to relay vital messages. Upon being deposited at the medical center, many burn victims are left unattended for long periods of time. American and German transfusion I.V.s prove incompatible. Ultimately, 16 more people will die from the severe burns over the next several weeks. The final person to succumb to his wounds is Strader, the pilot of the medical evacuation helicopter. 341 have suffered severe burns. Thousands more are traumatized, and a therapy group for survivors will meet for decades. In total, 70 people die in the accident — most of them Germans, including the unborn child of a mother who survived. At the time, this is the greatest loss of life ever at an air show. Recriminations and soul-searching ensue. Dozens of performances are canceled throughout Europe. The Flugtug airshow had previously attracted opposition from the local community around Ramstein over noise and safety concerns. After the accident, some argue air shows should be banned entirely, citing dozens of deaths in earlier accidents. Other commentators allege the Frecce Tricolori are too reckless or call for changes to aviation safety rules. Had the airshow taken place in the United States, FAA regulations would have prohibited the aircraft from performing the maneuver directly above spectators. The West German government bans all airshows for the next three years. It isn’t until a Berlin air show in 2012 that complicated aerobatic maneuvers are permitted again. After years of legal wrangling and parliamentary commissions, a joint German-Italian-American fund is finally set up to pay $21 million deutschmarks in compensation to the hundreds of victims mutilated in the accident. The emergency response action at Ramstein is also seen as a case study of everything that could go wrong, leading to major improvements and technical upgrades. There are other peculiar outcomes. 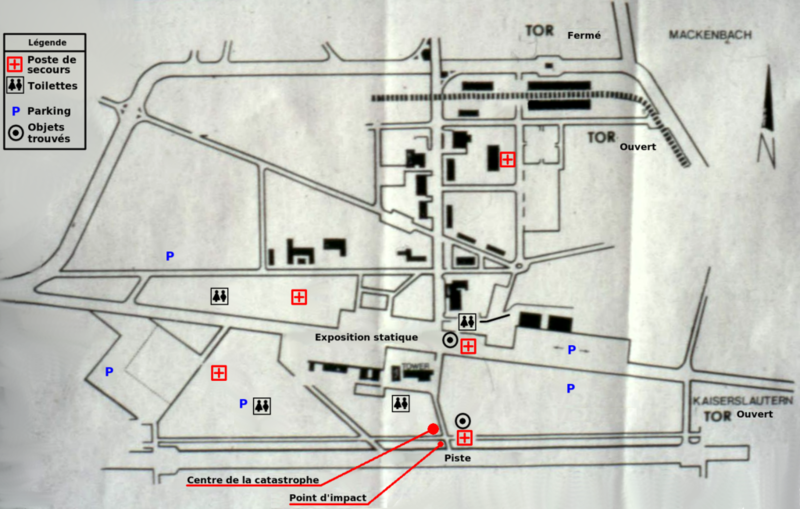 In 1991, members of the German and Italian press posit a conspiracy theory that Nutarelli’s plane may have been sabotaged to cover up the pilot’s connection to an ostensible airline shoot-down over Ustica in 1980, though no evidence was found to back this up. In 1994, a soon-to-be-famous German heavy-metal group, reportedly inspired by the devastating incident, adopts the name “Rammstein,” adding an M to the name by mistake. 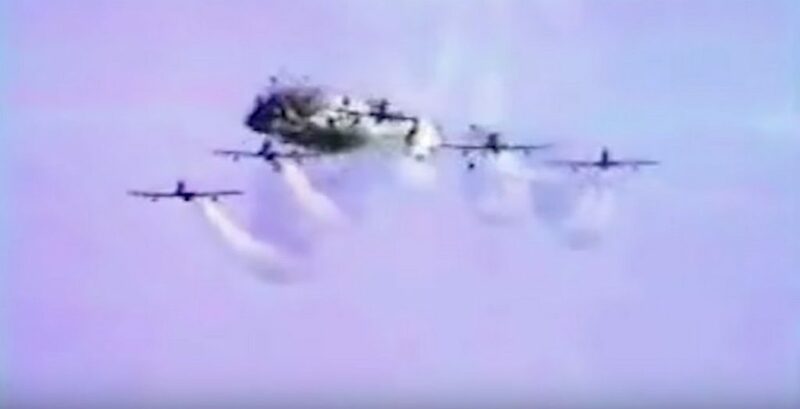 The Ramstein disaster results in major safety reforms for air shows, leading to regulations requiring performing aircraft to remain much further away from spectators and avoid performing maneuvers oriented directly towards the audience. The group therapy sessions improvised by survivors of the disaster become a model for future emergency counseling interventions in response to traumatic incidents. In July 2002, a Ukrainian air force Su-27 attempting a tight turn at low altitude crashes at Skynliv airfield and rolls into a crowd of spectators, killing 77.